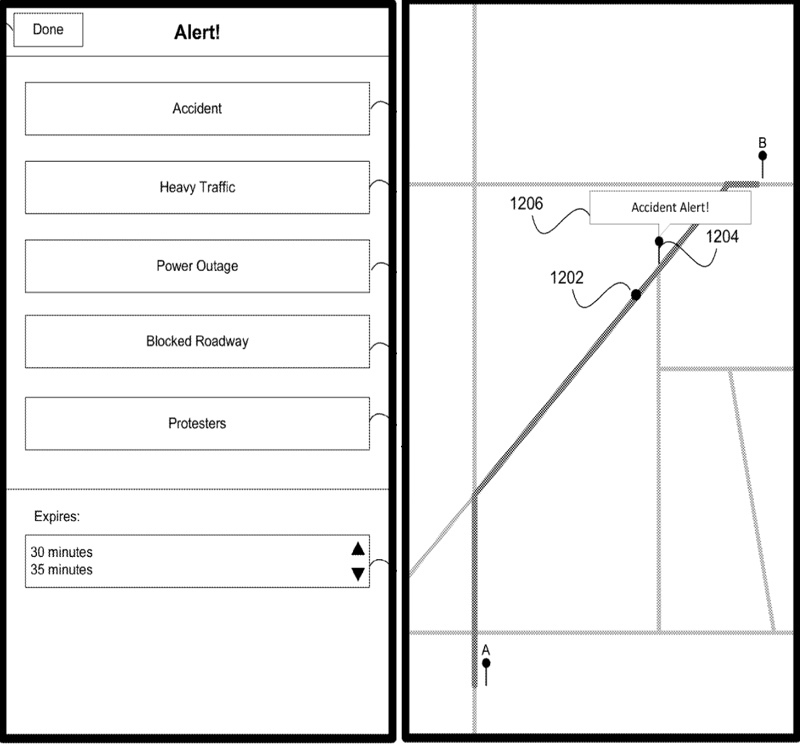 The U.S. Patent and Trademark office has published an Apple patent application that pertains to expanded mapping features, including real-time crowd-sourced traffic information and user-based route ratings and reporting, reports AppleInsider. Apple's patent, titled "User-Specified Route Rating and Alerts," shares some distinct similarities with Waze, a company that Apple was rumored to be purchasing at one point, though it was ultimately acquired by Google. 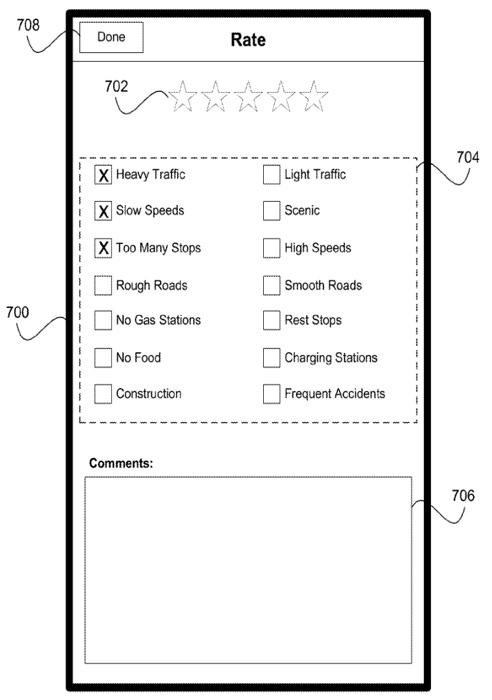 The patent, which was originally filed in 2011, details a system in which Maps users offer "ratings for routes, streets and/or locations," improving the company's mapping capabilities through user feedback. A system comprising: one or more processors; and a computer-readable medium including one or more sequences of instructions which, when executed by the one or more processors, causes: presenting a map display and a route on a mobile device; determining when the mobile device has reached a destination associated with the route; when the mobile device has reached the destination, displaying a prompt for input rating the route; and receiving user input comprising rating information for the route. Waze incorporates user feedback as well, using crowd sourced data to determine route details and travel times. Waze users can utiize the app's feedback system to provide the company with reports on traffic accidents, road closures, location accuracy, and more. With a similar system in place, Apple could allow its users to provide feedback and ratings on route choices, which could then be used to optimize travel. Apple's patent also details a process that would see the company collecting real-time traffic alerts and then distributing it to other Maps users, providing on-the-fly updates to routing information. A method comprising: presenting a map on a display of a mobile device; receiving a first user input identifying a location on the map; receiving a second user input providing information about an event occurring at the location; and transmitting the event information to a navigation service, where the navigation service is configured to broadcast the event information to other mobile devices. After a disastrous Maps debut alongside iOS 6 that saw a slew of complaints about inaccuracy and missing information, Apple has worked hard to improve the application. Tim Cook issued an apology and the company went through a restructuring that included the termination of several people involved with the Maps project, including SVP of iOS Software Scott Forstall and Maps manager Richard Williamson. Apple has since posted a number of job listings in order to add to its Maps teams, and has improved 3D flyover coverage in a number of cities. Both of Apple's upcoming operating system updates for Mac and iOS will include a number of mapping improvements, including a new app in OS X Mavericks. So basically they are copying waze and patenting it? Or you could just use Google Maps...which actually works. In all fairness, crowd sourcing this isn't a bad idea. I do it for DarkSky. But to think people will do it while driving seems unsafe. Seriously, Google Maps has plenty of flaws. On numerous occasions it has been off by a block or two. Sometimes more. And I can recall at least two times where it told me to take a path that did not exist. Should of just bought Waze. When is the patent office gonna stop giving out patents for obvious ideas? Seriously? I certainly hope the USPTO turns this down on grounds of being way too obvious. Our patent system seriously needs to be completely revamped. Although using google maps is not possible for me (to many errors in my region), the idea of rating is basically good. But if you read the text you see the rating of the route is done AFTER you reached your destination. But I am not so sure it makes sense to manually ask the user. Because why should be take the effort? Unless you can give him a good incentive to rate (like we find a better route for you if you drive it daily and you are unhappy with it), I think most of the informations could be collected automatically. If the street allows 50mph but you are driving with 10 there are some traffic conditions. I don't know how it is in us, but we also have tmc in Europe. That tells the navigation system about road problems. I am not sure why (or if) apple and google doesn't use these informations. (I know for sure that google doesn't use these informations because it even ignores if a highway is closed here). Would you be so kind to give these addresses ? So we can see if you are talking the truth? I am a heavy driver and not once apple maps lead me wrong. Someone has the stop the patent office giving these things out. This is getting stupid now, where is the innovation in this idea? They are just applying basic crowd sourcing voting on information. This time, that information is traffic info! Wow!! Big achievement!! I find the biggest flaw in Maps is really the directory. So I take a little responsibility and make sure the pin is located in the actual destination... Then the app guides me perfectly. I truck across the country and this has never failed me... And I'd do the same with google maps. Technology is cool but you have to take a little responsibility to make sure it's doing what you want.